Fantastic weather last week and the weekend made for awesome fishing and reports. Despite a couple of days of strong winds the fishing has still be excellent this week and with a big high approaching looks brilliant for the coming long weekend. *NSW Fisheries officers are going to be very active in this area over the coming weekend, so make sure your NSW fishing licence is up to date and that you are aware of size and bag limits for your chosen fishing location. Rivers:- Only three days to go. Rivers reopen October 2nd 2010. 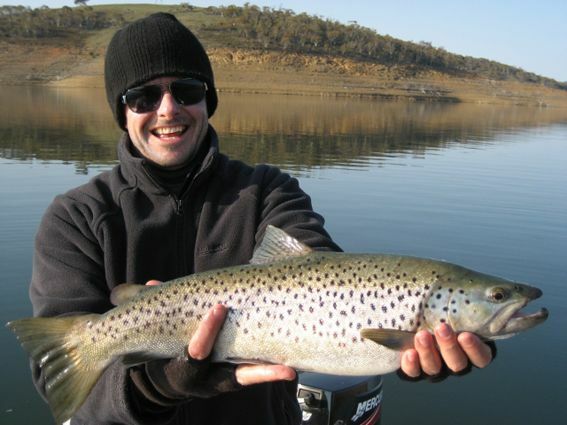 The weather is looking good for the opening and with both the Thredbo and the Eucumbene holding plenty of fish there will be plenty of fun to be had. Globugs and Nymphs are the go in the Euc and Thredbo with some Tungsten Nymphs very handy to get down with to the fish. There have been reports of fish rising during the day and also some caddis hatching so there is also scope for the dry fly too. 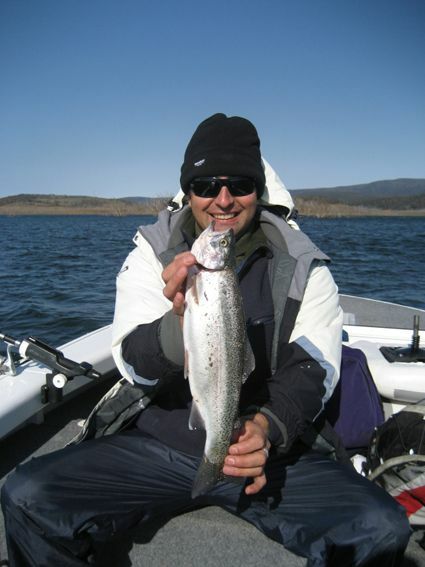 Lake Eucumbene:- Fly reports have been continually improving with some good silver rainbows around in many areas and little bit of polaroiding at times. There were some caddis hatches on dark last week and fish have been on snails and stick caddis in some areas. The lake now at 71% and rising looks amazing and the way it is shaping up the fishing will be as good as it was in late 2003. Midge are already on the wing and have multitplied. Evening rises have started after warm days. Eucumbene:- Eucumbene trolling reports have awesome with some nice rainbows showing up in many areas and a few browns too. Ive been following the report pretty closely the last couple of weeks and thought I might add what I have found over the weekend. We caught 21 fish in that time mostly ranging between 35 to 45cm and mostly rainbows in very good condition. A couple of browns were caught as well, although not as good condition. We found that trolling in the shallows over the recently covered flat grounds was the most successful using Tassie devils in yellow or green, or shallow diving minnows or hard bodies in natural colours. Saturday and Sunday were the most productive days bringing the sunshine and as a result the fish. A great weekend was had for dad and I, the weather really turned on a treat and fishing like we hadnt seen before, good size fish mostly in very good condition and in good numbers as well. We caught most of the fish on the cd3 and cd5 rapalas. Purpledescent, Bleeding Original Shad, Rainbow and Brown trout were the colours that caught most of the fish. We were also very successful with the loftys crobra 100y and the Tassie devil Y82 (Canberra bomber). 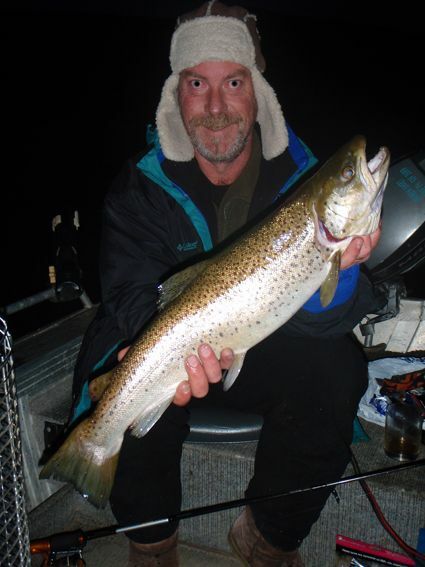 The one Brown trout we caught was the biggest fish of the four days it was over 60cm it was caught on the Tassie Y94 it was in Beautiful condition and got to live another day. Most of the rainbows were also in great condition averaging 35- 45cm and also got their second chance at life. We mainly fished around Old Adiminaby in the mornings, and Up near Powerlines, Toll Bar and Rainbow Point from mid morning to the arvo.. The fish were biting all day and were at all levels in the water.. Flat-lining and 12 - 20 ft was most successful. The weather was fantastic apart from the very cold frosty mornings....Will be back again soon to do it all again..
Other reports have been good with RMG scorpions in close taking rainbows again. All reports from trollers over the last week have been positive with all catching a least a couple of fish. Looking great for the weekend. 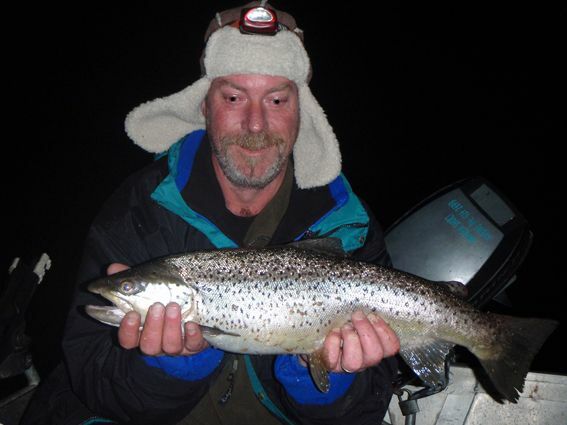 *Steve Jones and Bill Fogarty had a good night session in the lake over the weekend. Their method is something of a mystery and they are keeping it to themselves but one thing for sure is that it is effective. Have a look at these nice browns. Bait fishing has been outstanding in Eucumbene this week. Powerbait has been the major slayer though scrubworms dipped in Ultrabite have been dynamite too. Best reports are coming from the Middillingbank arm and Seven Gates areas. Best report was of a thirty seven fish session by one angler! After keeping his bag limit all the rest were released. Attached are a couple of photos' of my grandsons first fishing trip to Eucumbene. Three generations fishing for the day at Buckenderra. We went up to fix John's plumbing after the cold snaps this year and decided to fish for the day, as you do. Andrew, my son caught the first one within 5 mins then Blake then me. I caught a few smaller ones (letting them go) but was informed that they did not count. The prime bait for this trip was the Gulp Sherbet Burst. The photo of Blake on the verandah are the fish taken home for a feed. The three fish from his left hand are his ones. The best one went 45cm. The fish were all full of stick caddis. Ken Kain called over for a fish and took three good fish home. Like me he released a few as well. Looking forward to the comp this year as usual so we will meet up then. Please find attached a couple of photos of our weekend at Lake Eucumbene. 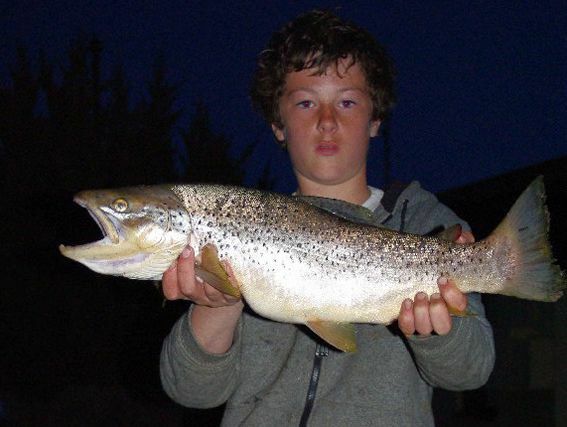 The Fish were caught on the 26th September 2010. The first Photo is of me, Nick Wozniak, then dad Tony Wozniak and then my brother Billy Wozniak. 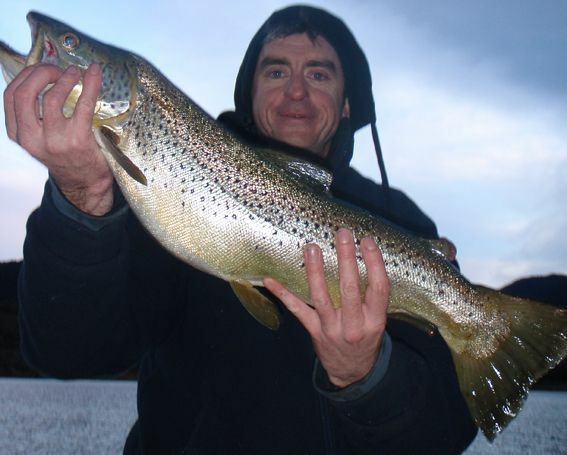 The other photo is of me and the 66cm long, 2.6kg Brown Trout I caught using power bait.